January | 2015 | Welcome to the RW Carbon Blog! 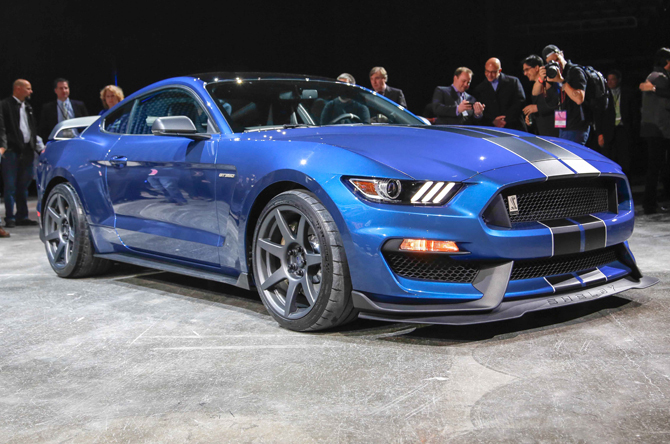 The new 2016 Ford Shelby GT350R Mustang made a big slash in the automotive world after it did a big burnout onto stage at the Detroit Auto Show. Since then this car has been at the pinnacle of conversion for automotive enthusiast around the world. 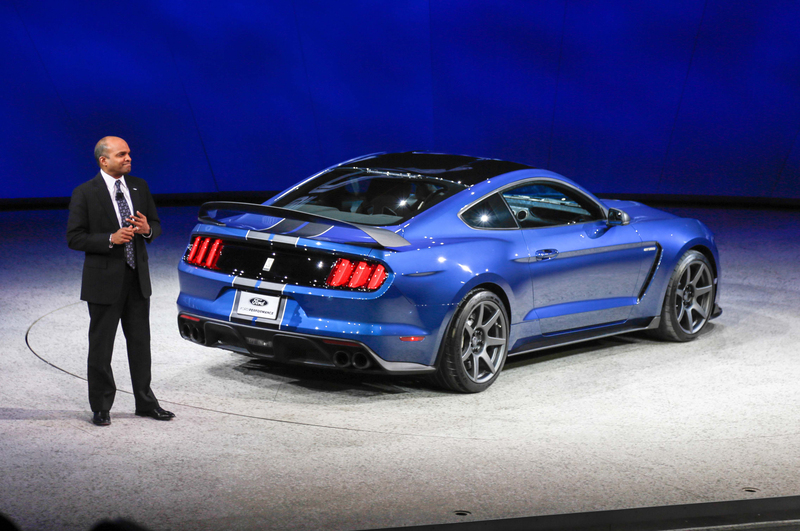 Ford says this model is now the most track-capable street-legal production Mustang ever built. 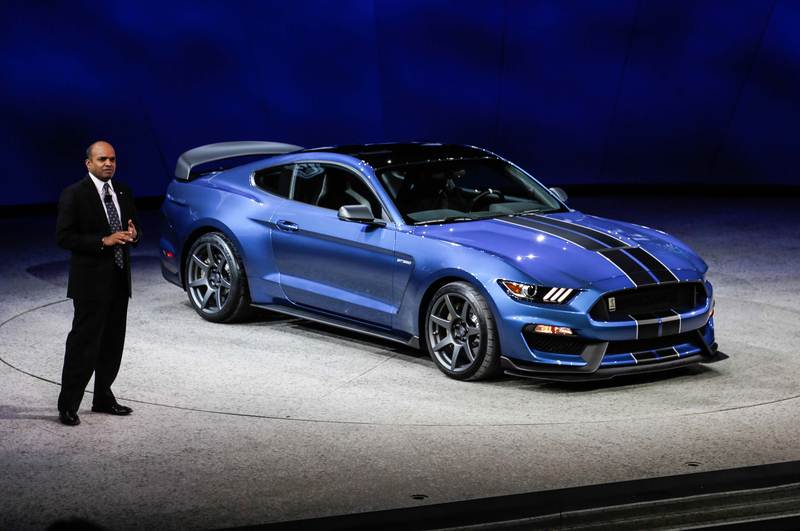 Although this car still pays tribute to the original GT350 competition model back in 1965, most its new designs and advanced features are aimed into the future. To start, the GT350R will be given an entirely new power-plant that Ford claims is the most powerful naturally aspirated production V-8 engine. It is also the first ever production 5.2-liter V-8 with a flat-plane crankshaft that is designed for high-speed breathing and comes attached to a six-speed manual transmission. 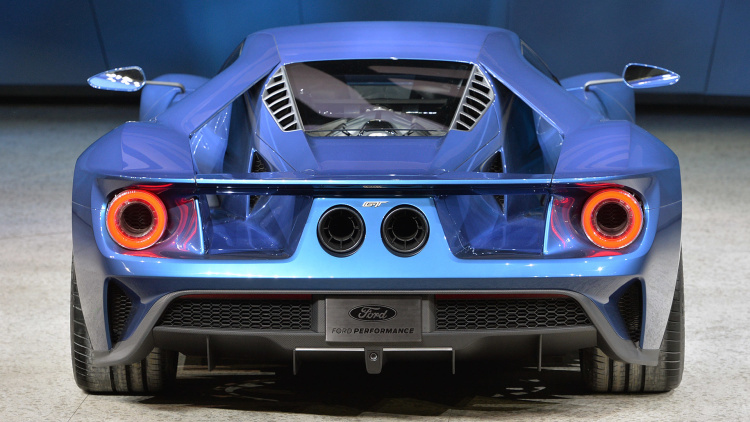 With all the new advancements Ford was able to produce 500 hp and 400 lb-ft of torque. Ford says the GT350R is completely new from the ground up, including the suspension which benefits from special tuning and revised spring rates, with anti-roll bars, lowered ride height, special track-tuned alignment settings, new bushings, cross-axis ball joints in the front suspension, and revised calibration controlling the MagneRide dampers. 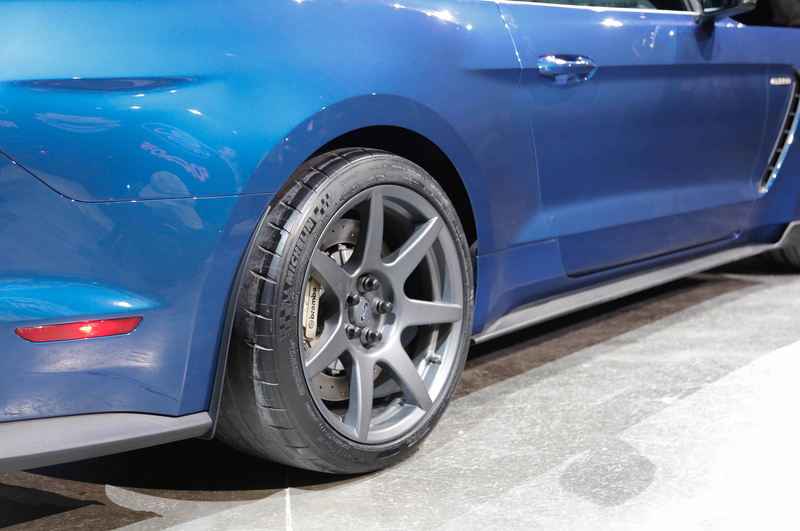 As for the ascetics of the GT350R, Ford with all out with new and aggressive aero parts. 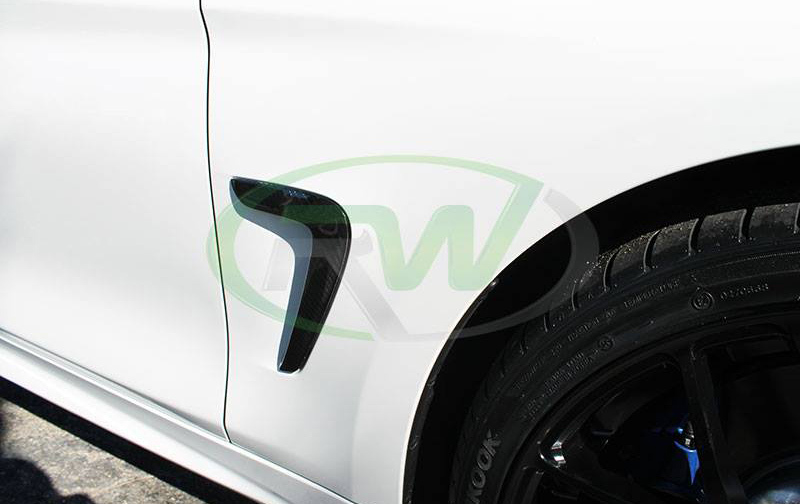 Some of these new additions include a hood vent, aggressive diffuser, vented wheelwells, fender vents, wheel air curtains, and side skirts all help the GT350R look mean while helping it cut through the air more efficiently. 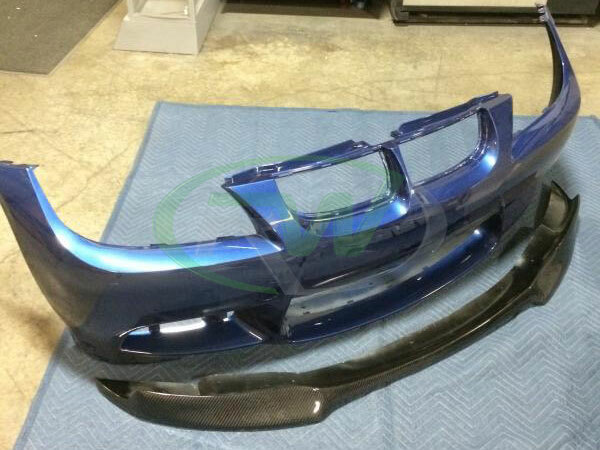 A newly revised front splitter maximizes downforce, and a carbon-fiber rear wing is a new addition. 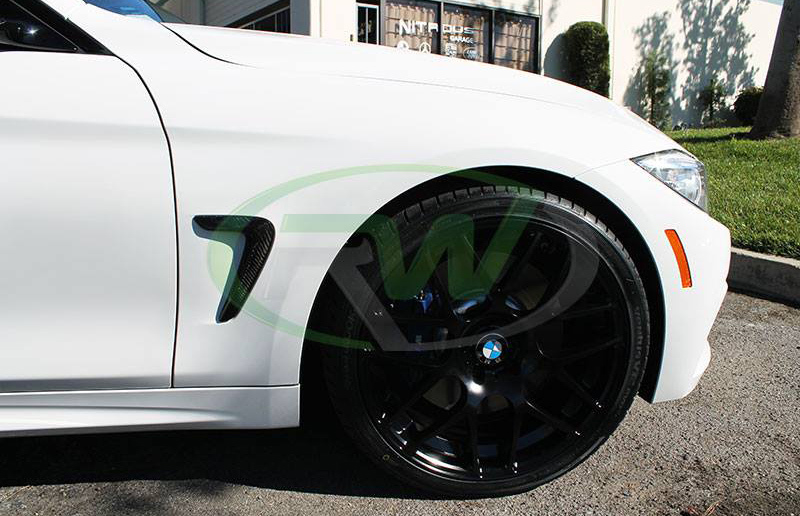 Leaving the best for last of course are the all new 19″ wheels made of carbon fiber. 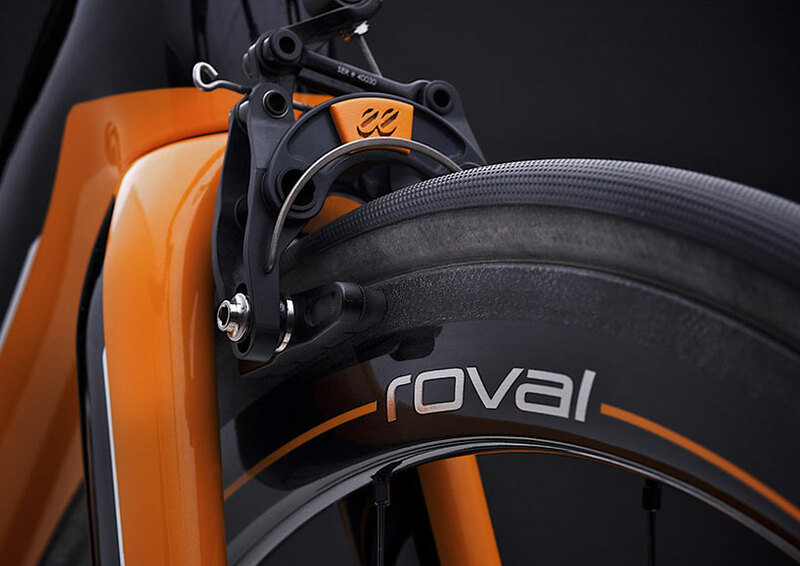 Made by an Australian CF manufacturer called Carbon Revolution, each wheel weighs 13lbs less than the typical 19″ alloy wheels and provide more rigidity. 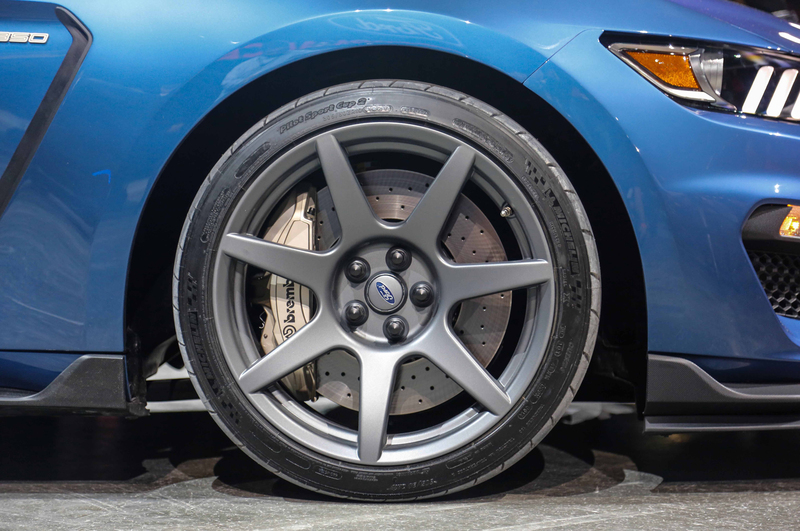 “Obviously the carbon-fiber wheels have been really exciting to work with,” Ford VP of design Moray Callum told us. “That’s a real first and helps get a little bit more stance in the car as well.” Those nifty new wheels decorate Michelin’s top-shelf Pilot Sport Cup 2 high-performance tires, 305mm wide at the front and 315 in the back. Ford engineers had an aggressive weight-savings target for the GT350R, and by the use of carbon fiber they were able to make their goal. Getting rid of things such as air conditioning, stereo system, rear seats, trunk floorboard, carpet, backup camera, and the emergency tire sealer and inflator helped shave off an overall 130 pounds compared to the GT350 Track Pack. If you find you do want some of that stuff, an electronics package that adds dual-zone air conditioning, 8-inch touchscreen, nav, audio system, turn signal mirrors, and more will be optional. 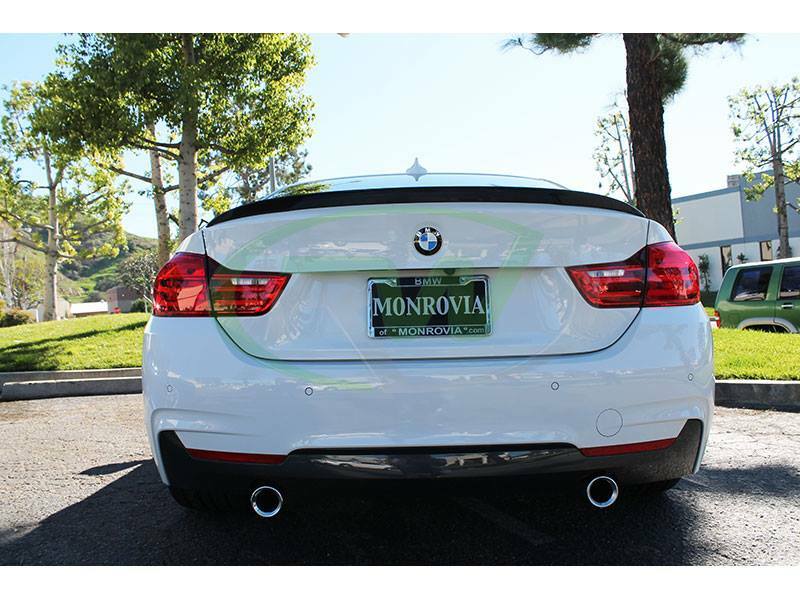 Today one of our local customers Brett stopped by to show us his F32 435i. 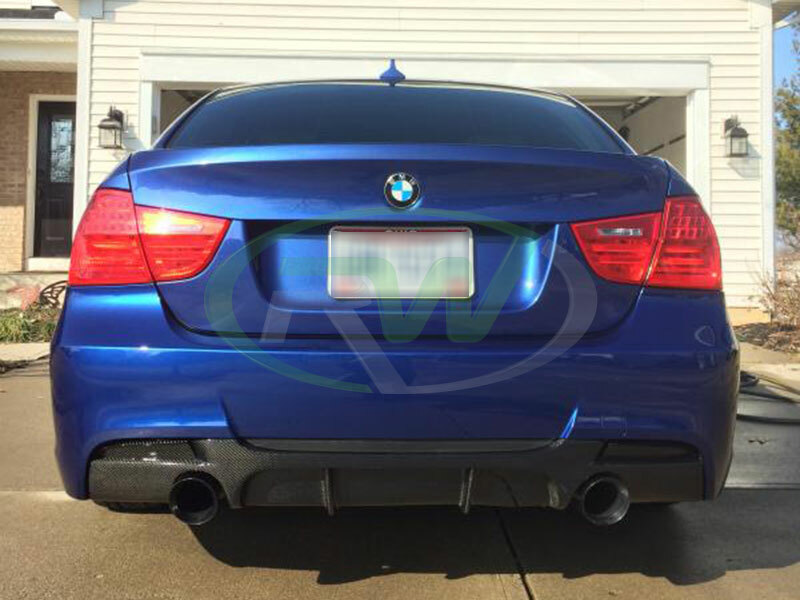 We previously sent him an F32 Performance style carbon fiber trunk spoiler which he installed at his house. 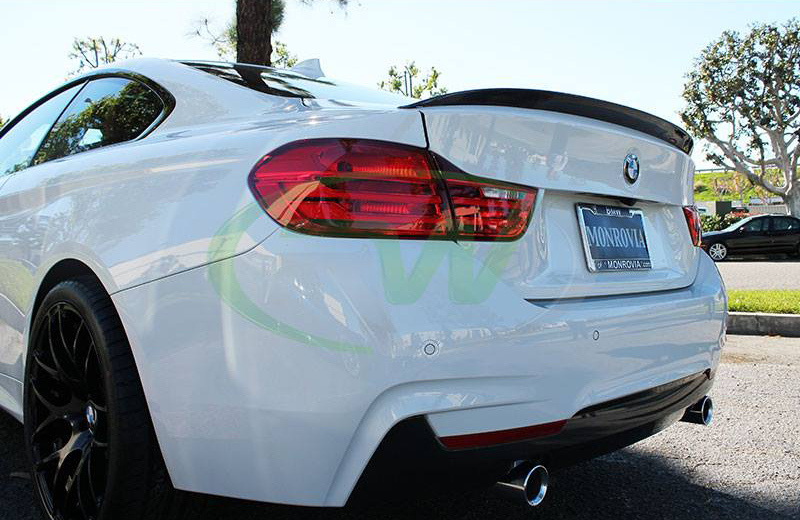 To compliment the CF trunk spoiler and the factory installed carbon fiber mirror covers we showed him our brand new F32/F33/F36 carbon fiber fender trim and he was in love. 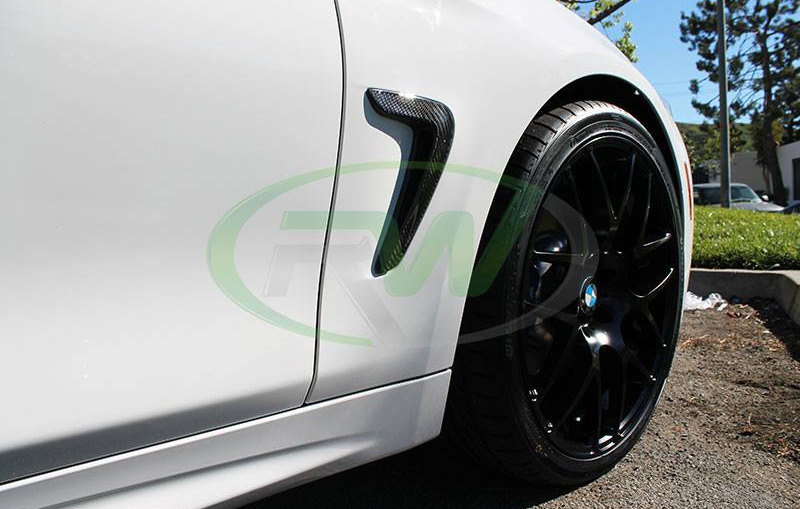 Since the carbon fiber fender trim pieces are so easy to install we put them on for him in under 5 minutes while he waited. 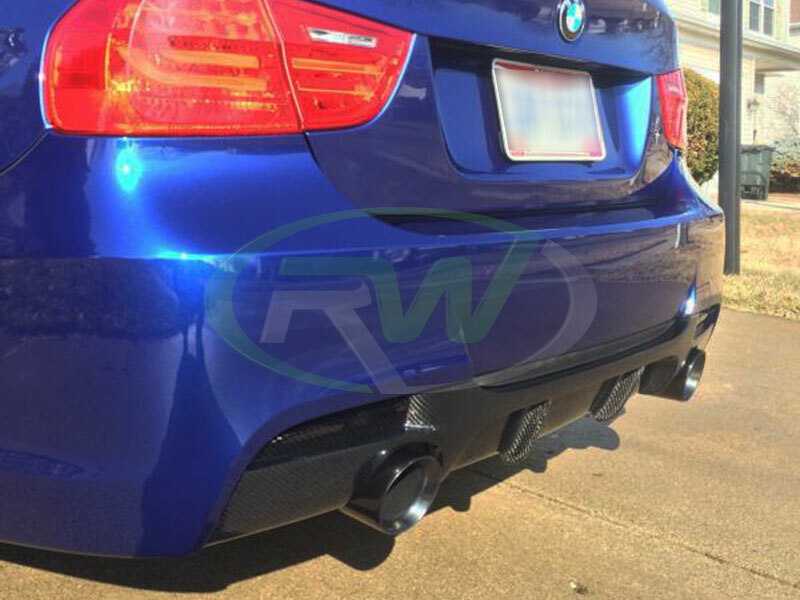 You can make your 4 Series look just like Brett’s with these modifications from RW Carbon. Check out the links below for more information and pictures of each detailed product. 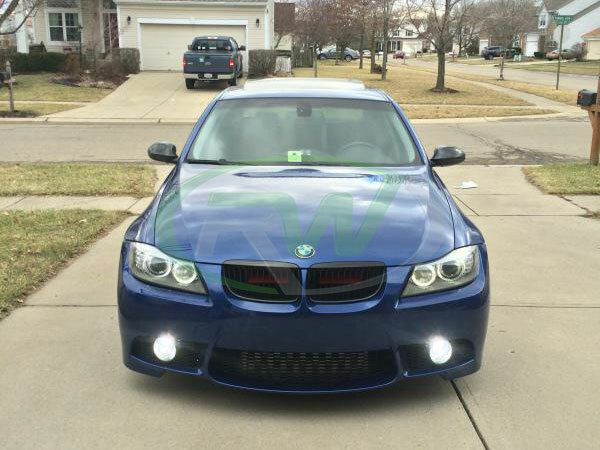 A big shout out and thanks goes to Adam, a very good customer of ours, for choosing us to be apart of his build. 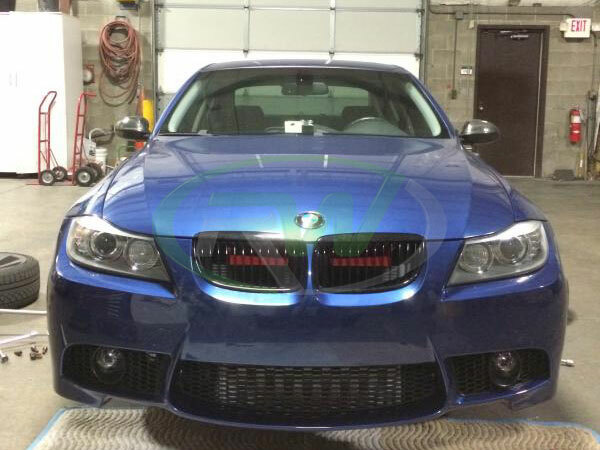 He first started with a stock BMW E90 Pre-LCI 335i. 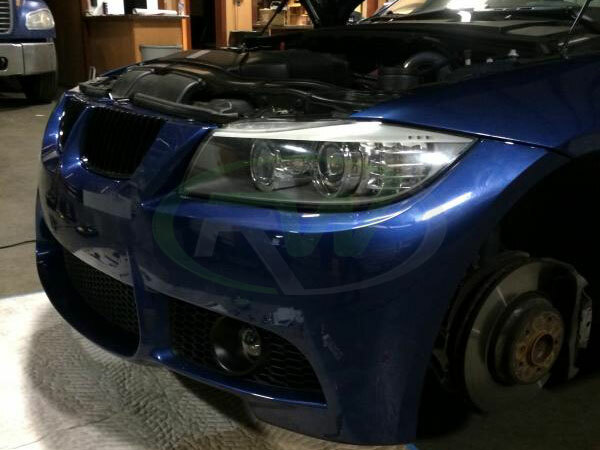 Since then he has been working on a full LCI conversion for his E90. 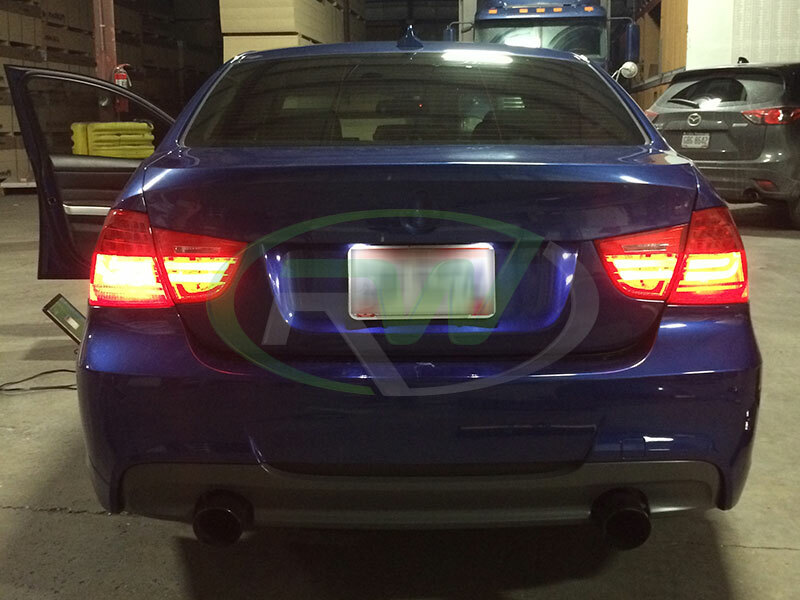 For the rear he updated the the tail lights, trunk and rear bumper to the LCI versions. 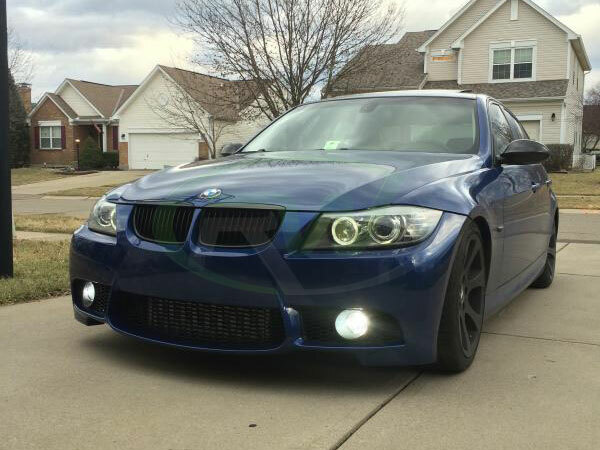 For the front he decided to go with the M3 Style front bumper, and LCI headlights. 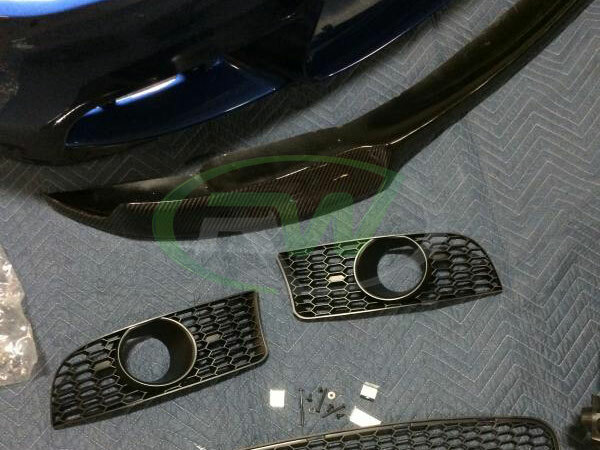 For the carbon fiber goodies, we hooked Adam up with a DTM CF Front Lip (being installed after winter) that is designed to fit the M3 replica bumpers. 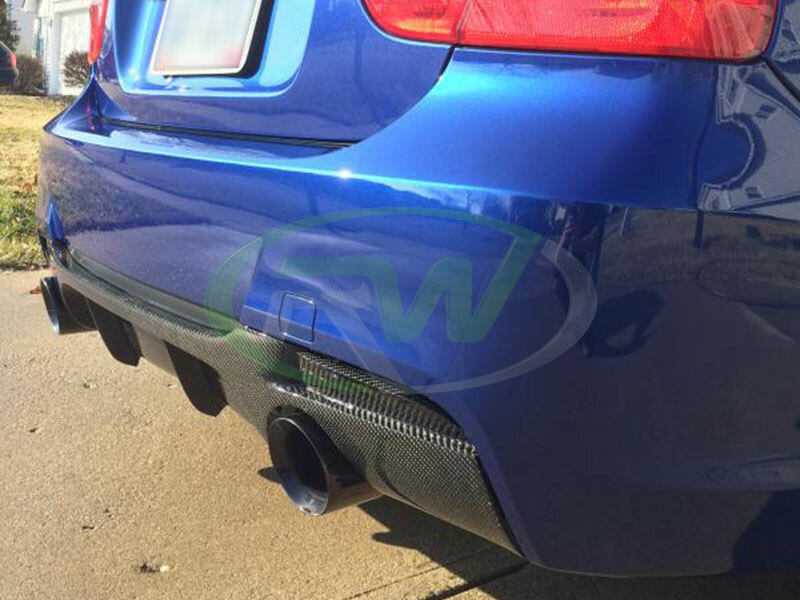 For the rear he went with a full carbon fiber performance style diffuser (on his way to him). Once everything is installed I will update with more photos. So far his car looks incredible. 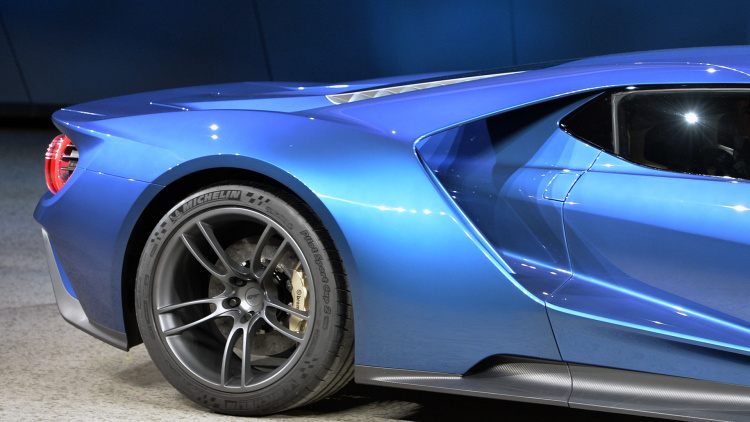 Probably the biggest surprise and most talked about car reveling at the Detroit Auto Show was non other than the new Ford GT. 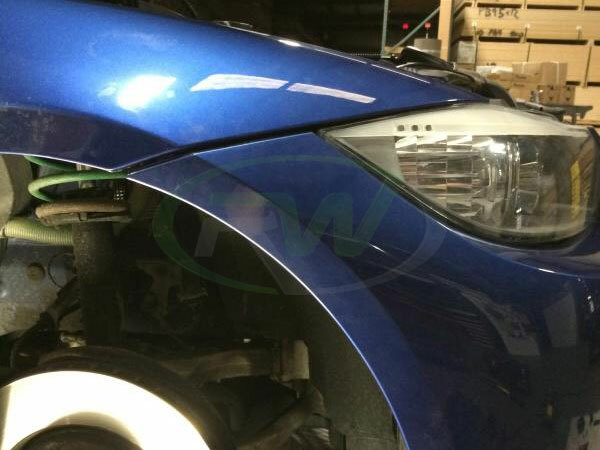 This soon to be production car looks to be straight out of a futuristic movie with its new and modern looking facelift from the old GT, aggressive lines and the use of carbon fiber all over the car. 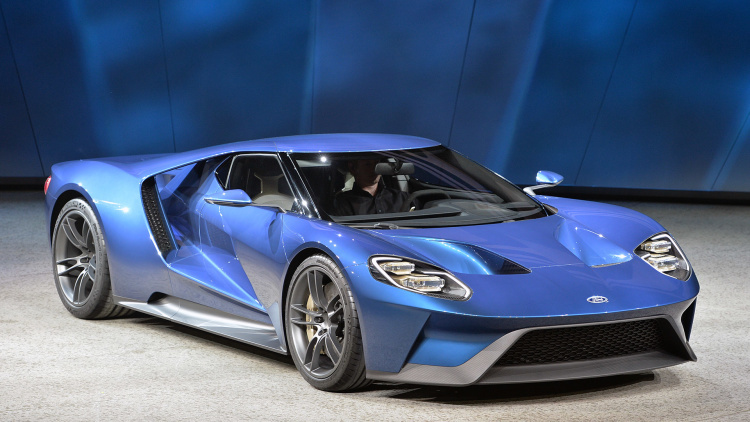 What might surprise the old Ford GT fans the most is not the new appearance of the car but rather what drives it. As we all know Ford is known for building their muscle cars with big V8 engines and for those special editions they came with superchargers. Well that is all about to change starting with the new GT. It is now equipped with a puny 3.5-liter twin-turbo V6 that produced a whopping 600+ wheel horsepower; making it the most powerful EcoBoost engine ever! This maybe the end of large displacement engines for Ford, but for all the power freaks out there this engine will satisfy every bone in their body. The engine is then mated to a new 7-speed DCT transmission, that can easily handle whatever that 3.5-liter engine can dish out. 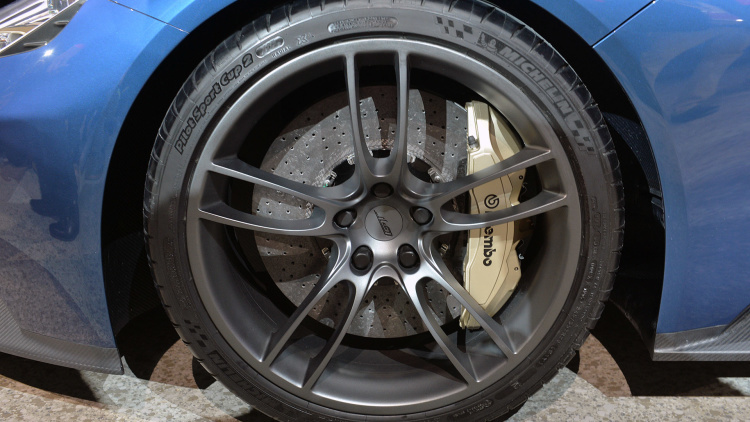 To keep all this power in check Ford equipped the New GT with carbon-ceramic brakes, 20″ forged aluminum wheels and a huge set of Michelin Super Sport Cup 2 tires. 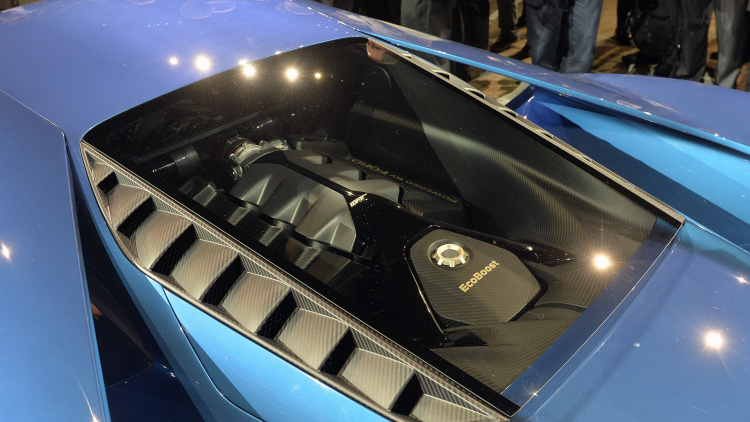 The rotors are not the only thing on the GT that has carbon fiber in them. The GT was completely built around a carbon fiber monocoque with structural carbon-fiber body panels and aero parts all present. This gives it that new and modern aggressive styling but also helps to lighten the load. 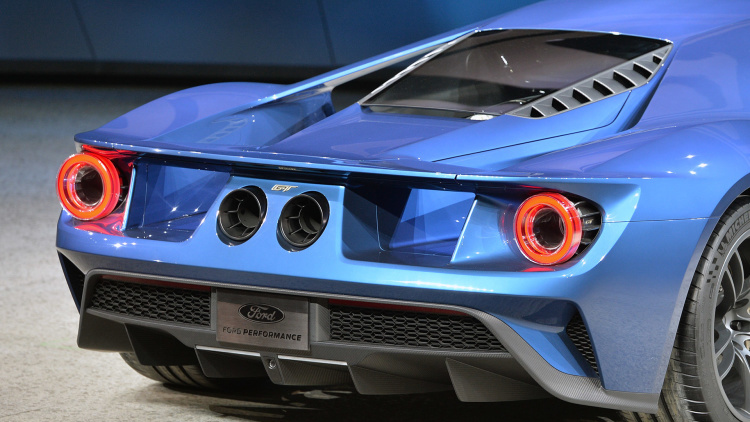 When is comes to slicing through the air, Ford did not leave anything to chance. They spent countless hours in the wind tunnel trying to perfect the the right aerodynamics and down force needed to keep the car planted at high speeds. 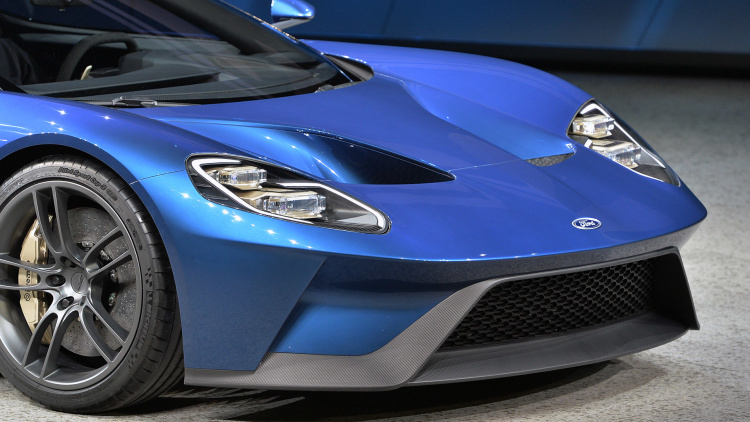 Ford made the new GT with a narrower canopy than its predecessors, cutting the frontal aerodynamic profile and tapering towards the back. 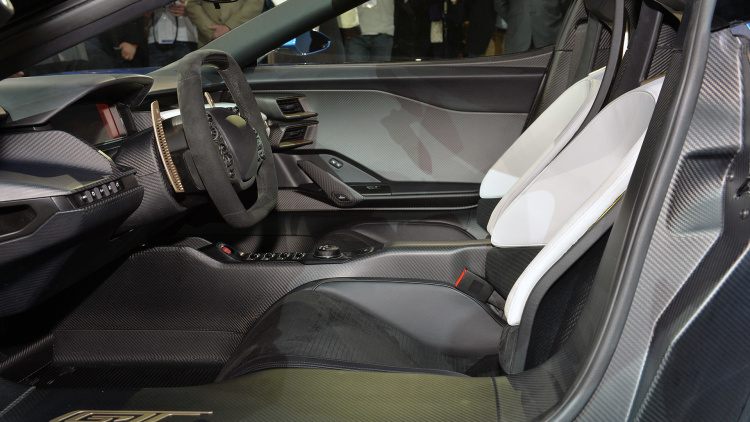 It’s also equipped with active aero elements including an active rear wing. Upwards swinging doors ought to make ingress and egress easier to and from the cockpit that’s fitted with fixed seats, adjustable pedals and F1-style steering wheel and a fully digital instrument cluster. 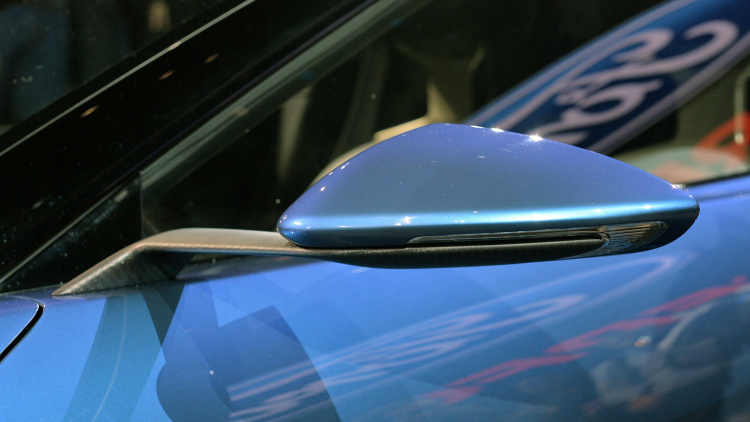 These two terms are often used interchangeably to describe the same product but they are in fact very different and have dissimilar functions for your vehicle. Watch the video below to learn the difference. Specialized and McLaren may seem like odd business partners, but they are both in search of one common goal. Their objective to create some of the worlds lightest and most agile vehicles this planet has ever seen. After combining their efforts and expertise in the fields of carbon fiber and aerodynamics, this duo seems a lot less random. 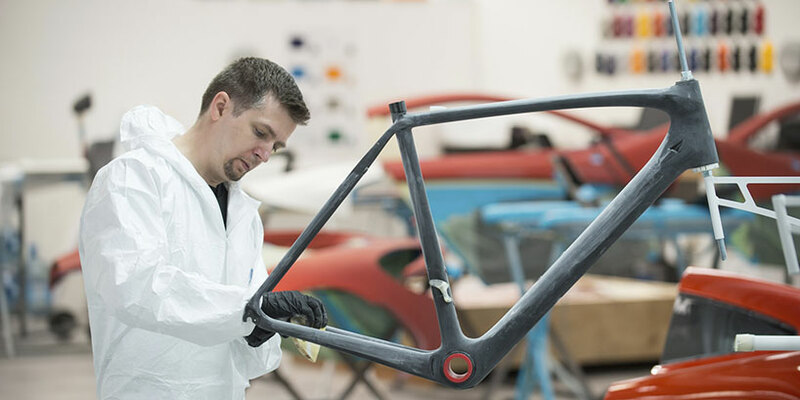 After months of seamless technical collaboration with McLaren, Specialized introduced the “S-Works McLaren Tarmac.” Conceived to take the place of the Venge, Specialized hopes the Tarmac will introduce an entire new standard for carbon fiber road bike construction and engineering. 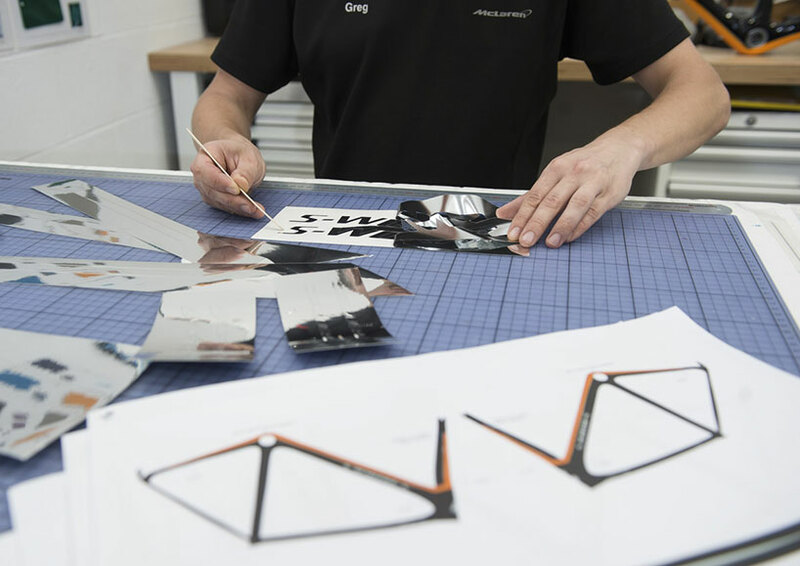 Utilizing McLarens vast knowledge on carbon fiber manufacturing and construction, Specialized was able to design this new frame to be 10% lighter than the standard Tarmac from while still keeping its strength and rigidity. 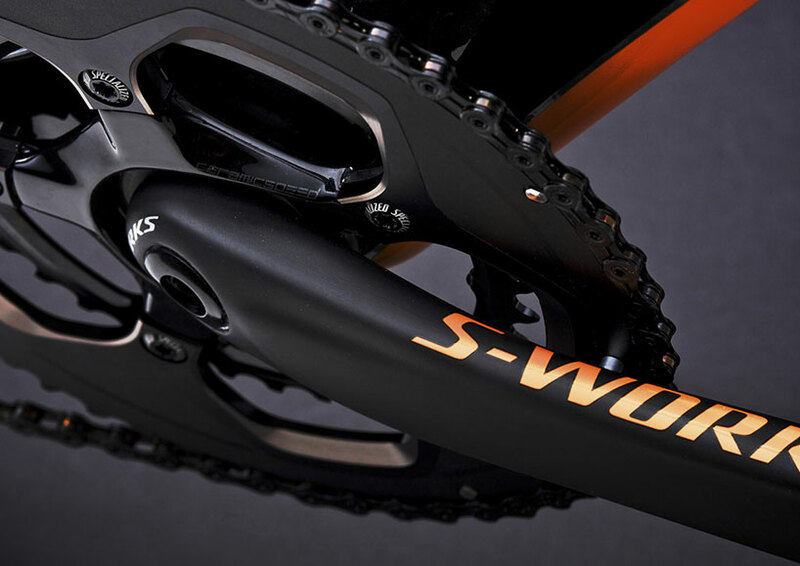 To accompany the new state of the art bike, Specialized created the crankset, aerofly handlebars and clx40 tubular wheel sets all with the same carbon fiber construction to reduce weight even further. 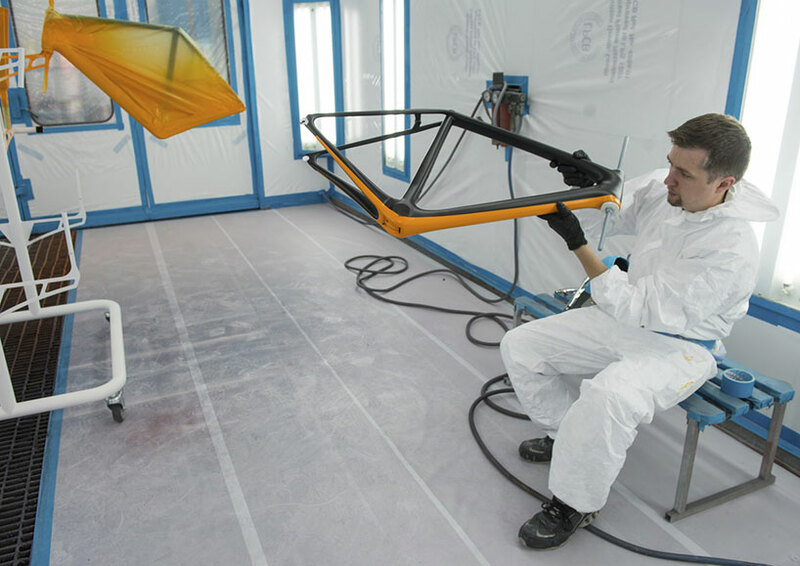 Rounding out the package is a custom McLaren themed paint job that is painted in house at the McLaren factory in the UK. 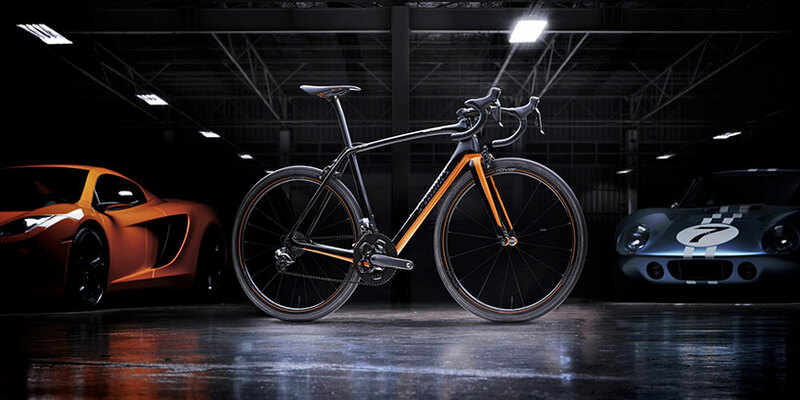 Specialized is only releasing 250 McLaren Tarmac bikes worldwide. 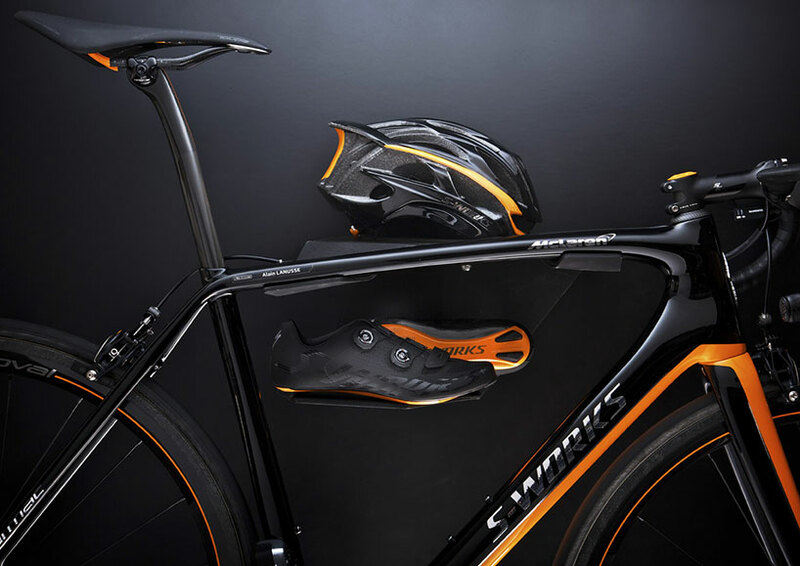 Each bike will come fully equipped with matching road shoes and helmet. Additionally, each Tarmac will be built to the individual specializations of the rider based upon the body geometry for a truly personalized experience.